Canada’s top selling probiotic! Ultimate Flora Critical Care delivers 50 billion beneficial bacteria from 10 strains in each protected capsule. It is the perfect balanced formula to help maintain good digestive and overall health while boosting immunity and easing constipation. When nothing else seems to work, Ultimate Flora Critical Care DOES! Ultimate Flora Critical Care’s blend of 50 Billion active cultures from 10 different strains in a ‘once a day’ serving helps ensure a healthy microbacterial environment in the intestinal tract. The term ‘probiotic’ means supporting life. Probiotics are friendly, beneficial bacteria. These bacteria (as well as others) are normal inhabitants of the large and small intestines and are a very important part of a healthy digestive system. There are over 500 types of bacteria in the digestive system; the two most prevalent are Lactobacilli and Bifidobacterium. Bifidobacterium are the most prevalent bacteria in the large intestine and Lactobacilli are the most prevalent in the small intestine. Ultimate Flora Critical Care contains therapeutic levels of both Lactobacilli and Bifidobacterium, making it the most complete and effective probiotic supplement on the market. Each capsule provides 50 Billion active cultures from 10 different strains in a ‘once a day’ serving (30 billion active cultures of Bifidobacterium and 20 billion active cultures of Lactobacilli and Lactococcus). Ultimate Flora Critical Care also contains FOS (fructooligosaccharides), which is an optimal food source for probiotics. FOS aids in the colonization of probiotics in the intestinal tract. Ultimate Flora Critical Care uses a unique, water based enteric coating that protects the probiotics against being destroyed in the acidic environment of the stomach, yet still allows for the probiotics to populate in the intestinal tract. 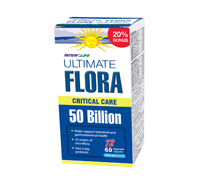 Ultimate Flora Critical Care contains no starches, fillers, or excipients – making it the cleanest product available. Adults, adolescents and children 6 years and older: Take 1 capsule per day, approximately 2 hours after food. Warnings: Consult a health care practitioner prior to use if you have nausea, fever, vomiting, bloody diarrhea or severe abdominal pain. Discontinue use and consult a health care practitioner if symptoms of digestive upset (i.e. diarrhea) occur, worsen, or persist beyond 3 days. Do not use if you have an immune-compromised condition (i.e. AIDS, lymphoma, patients undergoing long-term corticosteroid treatment). Keep out of reach of children. Requires refrigeration. Do not expose to heat. Potency guaranteed at expiry. ALLERGEN WARNING: This product has come into contact with milk and soy from fermentation ingredients. Do not use this product if you have a milk or soy allergy.